SET OF SIX stackable universal egg trays (#0246) for GQF Sportsman and many other type incubators / hatchers. 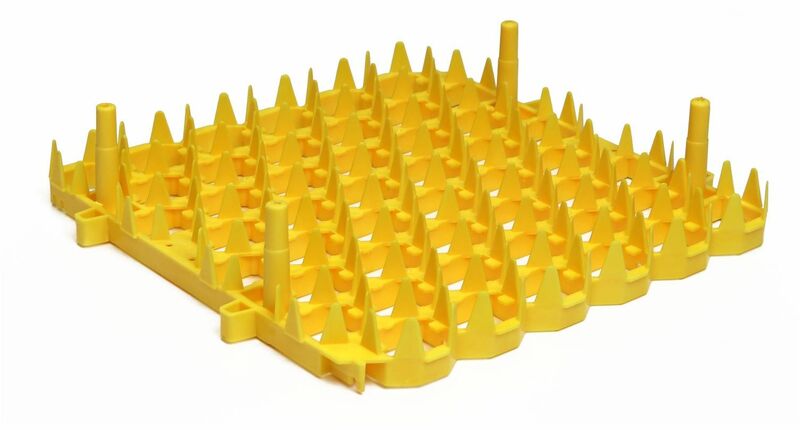 Plastic egg trays offer the most efficient system for gathering, spray disinfectant treating and storing of eggs. At time of setting eggs, just remove loaded egg tray from storage area and place it on the incubator turning rack. The No. 1500 and 1502 incubators are equipped with turning racks that will accomodate plastic trays to hold your eggs in place. Holds any size egg from bantam, to pheasant, to medium chicken egg. Each of the No. 1502 turning racks will hold 2 universal egg trays (90 eggs) for a total of 270 eggs per incubator. (Not Stackable in GQF incubators).